it is always a delight to guide 6 eager students through exercises that challenge and renew their understanding and satisfaction around the sometimes scary and precipitous act of making art! It was an abnormally quiet but productive 2 hours with 5 local women making art. Take a look at their creations.The emphasis was on composition and the elements and principles of design. Have to say the exhibit of my work looked very wonderful with Bob Leatherbarrow's stunning glass pieces. 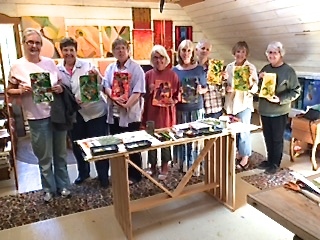 May 2017 Morning Class What a great morning with a bunch of great women - all making art! Summer Fun - Former Art Students eager to have some fun! Kim, Sue and Nancy present their favourite collage pieces. Such a pleasure to have them in my studio. Summer Fun! Studio Time with Judith - Check it out! Have a look at the creations of these budding artists! Words of wisdom from noted artists, a cup of tea and brief sharings of intention and works began most of the 6 classes. We had fun and the exercises created some ease and facility with acrylic paint for everyone. Red Tree Gallery Artists on the Hope Bay Dock - I'm on the right! Fall classes are now over but there will be more fun to be had in the spring. Stay tuned!